I’ve been to the Gulf Coast countless times. Galveston with my parents, sisters and cousins. South Padre with many of the same. I’ve even been way over to Destin and Sanibel, Florida. As a child, going to the beach was a yearly trek I couldn’t wait for. As an adult, I hadn’t been to the coast in decades and I wanted my children to see it and fall in love like I had, long ago. So I looked for a Texas beach. Padre was too far to drive in one day. Galveston was, well, Galveston (no offence intended). So I asked my social media friends for recommendations. A high school pal suggested Crystal Beach. Winner! I had never been to the Bolivar Peninsula. The drive would be long, but I didn’t mind because I am a bit of a wanderer. That’s not to say I’m bold or brave. I’m not really drawn to adventure, but I love the romantic notion of finding what’s around the next bend in the road. So I packed my husband and the kids and we set off from Tahoka. I am driving and I know where I am going. It’s the place my land-locked soul impatiently waits to be again. The red sand flew from our Suburban as we drove southeastward. Post, then Brownwood and Waco. Finally, on the other side of Houston, my senses began to sing like a John Denver song. The clouds were closer to the earth, heavy with gulf moisture. The land began to feel low and easy. We made our way to Highway 124, a country lane I had never seen. It was a lot like our rural neck of the woods, but with more trees…and more green. Graceful lawns roll up to white farm houses. Round hay bales dot the fields. There was a produce stand along the way, neat and inviting and I thought about stopping, but didn’t. We sailed over a tall bridge at High Island and saw a tug pushing its lazy barge through the channel. Just when I’ve almost forgotten our destination, I find an abrupt turn, a right angle in the road. Texas 124 became State Highway 87, the mainland became the Bolivar Peninsula and the Gulf leapt onto the sand, delighted to see me again. There was my long lost love. Finally, we arrived at Crystal Beach, where we came to find our home for the week. Our pastel castle on stilts. Then we commenced spending care-free days in the warm sun, becoming different people entirely. We were baked and browned, messy-haired shell seekers, combing the beach for hours, finding sea glass and angel wings and other treasures. We were tourists boarding tall ships and battleships and ferries. We were wave-chasers, playing in the windy surf. I reveled in every minute, each one brought to me by some roads I had never been down. Splendid threads of pavement, weaving me back home. Things and people and places change, but I am always looking for home. I find it in the familiar. This trip, home was the sea breeze and sea gulls. It was the roaring surf, the delicate shells and the tiny, uncatchable crabs. All the things I told my children they would find—and they did. Home was watching my teenagers play like little kids together on the beach as my sisters and I once had. The days were slower. 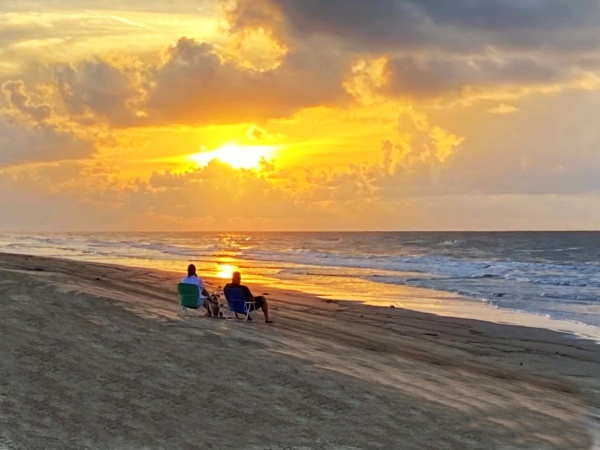 Sunsets lingered just ahead of cooler evenings and the salt-air nights were filled with a sound you only hear in two places: Inside a big seashell and…at the beach. Reluctantly, at the end of our week, we loaded up and left this hidden piece of Heaven. We had a bit of white sand in our shoes, tanned skin, some good memories and smiles on our faces. The sweet things. For a little while, I had become my mother and my children had become my sisters and me, visiting a familiar place I had never been. For those moments, life was especially good. Oh my soul, I must get back there! I wrote that this story was about our trip to Crystal Beach, but I guess it is really more about going home, even though we had never been there before. Though the story means a lot to me, I am not sure it will be anything but sentimental and mushy to anyone else!